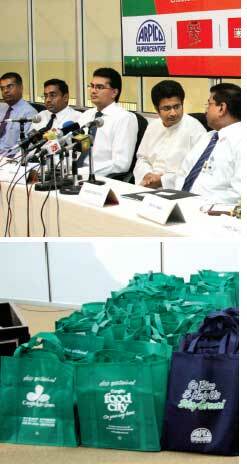 supermarkets in Sri Lanka have come together to discourage the use of plastic shopping bags. As part of a three-phase environmental campaign, they have joined hands with the Central Environmental Authority (cea) and introduced eco-friendly shopping bags, mostly made of jute, at a nominal rate. The bags are being made available since August 1. While most consumers appreciate the move, environmentalists see this as a money-making exercise of mart owners. But the chairperson of cea, Udaya Gammanpila, is hopeful. Sri Lanka's import of polythene has dropped since a ban on the use of polythene products below 20 microns in January 2007. This initiative by supermarkets will further curtail the use of polythene bags, he says. Supermarkets cater to only 15 per cent of the country's retail market but provide millions of free bags to consumers. "We used to provide 3.6 million free shopping bags at our counters every month," says Sidath Kodikara, executive director of Cargills Ceylon Ltd, one of the biggest supermarket in Sri Lanka. Kodikara hopes the move will bring about an immediate 30 per cent drop in the use of plastic bags and 50 per cent drop in the next six months. The marts will, however, continue to provide free polythene bags for carrying meat and other perishables items. Some supermarket chains have also announced their intent to charge consumers for every polythene bag they dispense at checkout counters. In subsequent phase of the campaign, the supermarkets will launch a massive awareness campaign to curb the use of polythene bags and set up collection points where consumers can dump discarded polythene, such as plastic bottles and bags. cea, meanwhile, is planning to set up a plastic recycling plant.